by Clyde Hall, Brendan Hodgdon, Sara Mitchell, and Jarrod Jones. Undercover is our opportunity to lovingly gaze upon gorgeous works from magnificent artists. From Adam Hughes’ ‘Superman’ variant to Mitch Gerads’ vertigo-inducing cover to ‘The Flash’, here’s what we’re loving this week. JJ: It’s a train just like any other, in a city beyond any standard reckoning. Busted, standing still, leaving its passengers to stew over the prospects of cooling dinners and prolonged soaks in the tub. But in a city such as this, whenever there’s a delay, take a breath. Maybe two. You can always count on a hitch from a friendly stranger. Wearing a cape and bright boots to match. He’ll get you where you’re going, but fast. Welcome to Metropolis, U.S.A.
It’s a marvelous feat given Rockwellian charm courtesy of Adam Hughes. 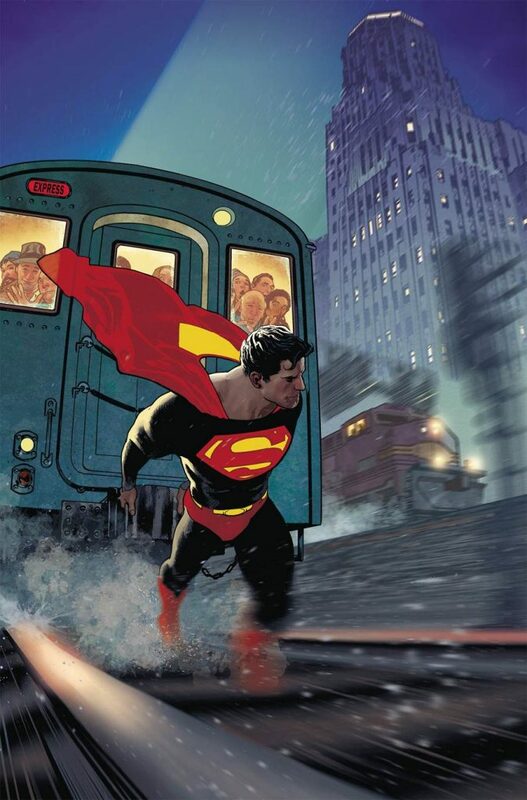 Hughes is the current variant steward of the Superman magazine, capturing the terrific aspects of a world-famous character in lovely, literal fashion. This week: More powerful than a… well, you know. The artist depicts strength and power though the illusion of motion, achieved via excellent blur effects and other special techniques. Hughes lets the headlights of the evening express illuminate the taut musculature of our savior as he ferries a cadre of spectators towards hearth and home. Boots kick up the rail’s pebbles—we’re really moving now—and look! A speeding train parallel to this fascinating spectacle has added a bit of challenge to an already peculiar commute. Heck, why not—Hughes makes a race out of it. Our grins widen a bit more. SM: Are we infinite? If you chipped away forever, would there always be a new layer of the self awaiting to be discovered? Maybe the version of you that you’ve always wanted to be is down in there, waiting for you to bring her to the surface. The wiser self, the wilder self, the best self—the self you deserve. Maybe it’s a dangerous, seductive stranger luring you down into Dante’s Inferno, a tightening, finite gyre of punishing layers. What if these inner selves were dangerous and stronger than you? What if they wanted out, leaving the thin decorative covering we call identity completely shattered? 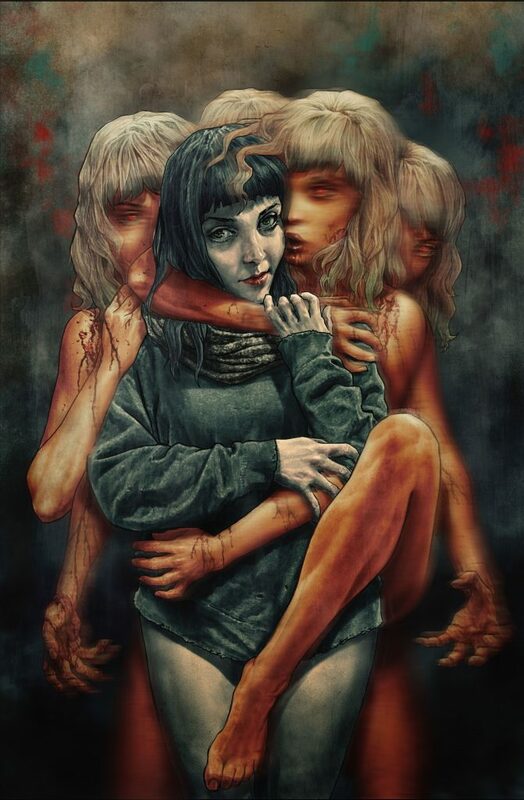 Faith, pictured here on Lee Bermejo’s variant cover to Faithless #1, is a curious young woman. Dissatisfied with the way the world has presented itself to her, she’s beginning to dig deeper within herself. She’s conjured up quite the entanglement. While being held in the grips of her own desires and her own mystical forces, she embraces her self. And her self in turn holds her. Their collective eyes on us, they seem to invite us forward, daring us to accept Faith entirely, with all the facets of her exposed, naked at the surface. Not just the veneer of Faith, but the boundless entities within. CH: Amanda Conner’s style is simple yet oh-so-perfect for covers with a lighter, more humorous sensibility. Her Beach Blanket Bad Guys wrapper art for DC last year still gives me giggles, and that places Conner in the company of “Magnificent” Marie Severin. I still pull down my battered copies of Not Brand Echh for a Marie fix when I’m feeling low, and I’ve some Amanda Conner work on hand for similar purposes now. Like Severin, Conner is also adept at playing it not only straight, but even superhero iconic when the issue calls for it. She and Paul Mounts have delivered such goods for their variant on Supergirl #29. Bold and brassy colors, overlong capes, and stars. Such a field of stars. If this cover doesn’t prep you for spring, nothing will. 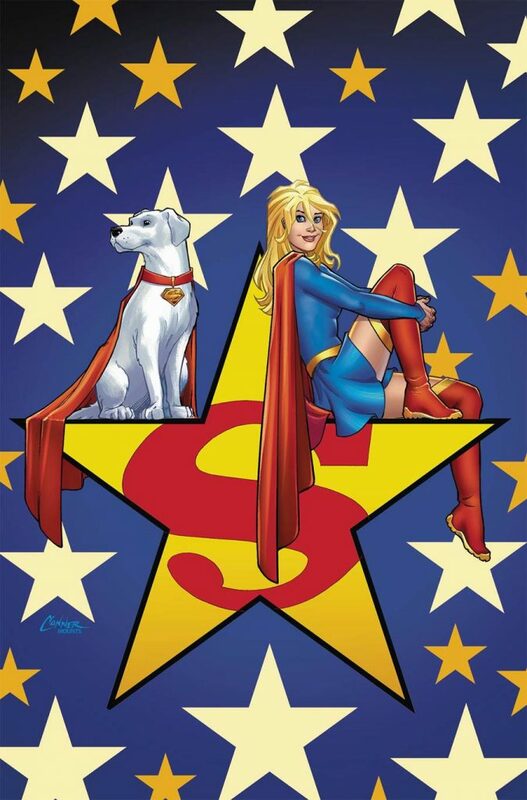 If you can’t feel the warmth of Earth’s yellow sun radiating from Kara’s smile, if Krypto’s canine magnificence doesn’t warm your cockles, you have a terminal case of the Goths. 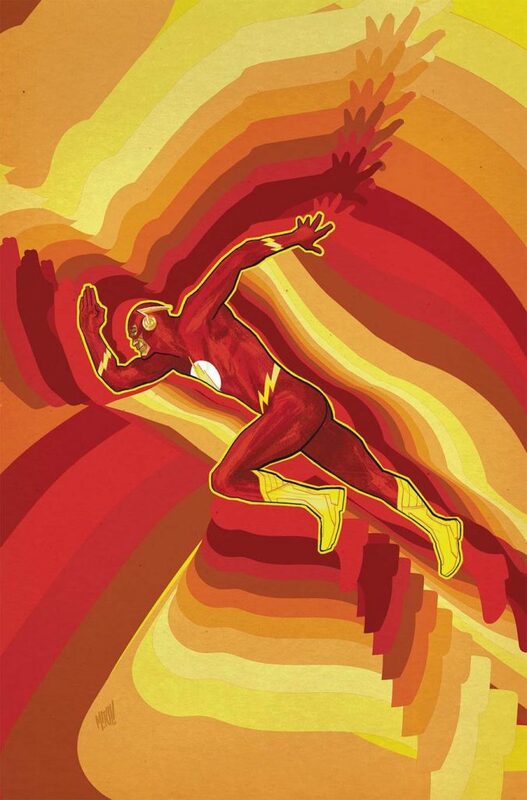 BH: The Flash may be the Fastest Man Alive, but his ability and impact transcend the concept of mere footspeed. The Flash can break the space-time continuum, commune with an elemental energy source, and exist between the ticks of a second. With the low-key trippiness of this cover, Mitch Gerads hints at all of this, and more. Here, we see Barry Allen mid-sprint, dashing towards some unknown crisis. His speed is such that we see these echoing waves of gorgeous color radiating off of him, mimicking and amplifying his general silhouette. It immediately gives this single still image of Barry a sense of movement, without resorting to the usual speed lines or such. Beyond that, these waves skew slightly the further out they go. It suggests vertigo, and plants the idea of the Flash spinning or falling in one’s head. With this, Gerads shows Barry not just in motion, but lost in a tumble while moving at such speed that we can’t even comprehend the world around him. Given the eventful few years Barry has had in the Rebirth era, it’s quite the appropriate vibe. It’s certainly no secret that Gerads is a talented artist. This piece reinforces how clever he can be, and how much he can say in one image. It’s an ideal summation of the Flash, and an eye-catching cover to find on the shelf. Don’t forget to share your favorite covers from this week in the comments section below!